Delivering rapid, cost-effective, and accurate analysis (as well as efficient storage) of next-generation sequencing (NGS) data is the goal of a bundled computing and storage solution recently developed by Edico Genome with Dell EMC. The exponential increase in the generation of genomic data to support research, for clinical use, and to drive precision medicine is testing the limits of many technologies to both quickly analyze the data and to store and manage that data effectively. The two companies hope to address that need with their bundled offerings. 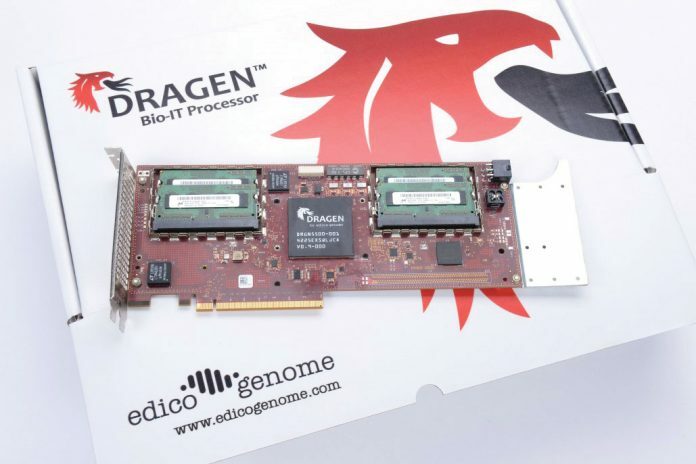 “Our collaboration with Edico Genome provides an innovative way to cost-effectively reduce the computational time required for the NGS data analysis pipeline by reducing time in the mapping, alignment, sorting, and variant calling—currently performed by software on extensive cluster or cloud-based platforms—from hours down to minutes, and without compromising accuracy,” says David Dimond, CTO, global healthcare, Dell EMC. The bundle can enable analysis of a whole genome in 22 minutes, compared with 20 to 30 hours using standard software. “In the cloud, it’s even faster. Our speed to analyze a whole genome is six to eight minutes,” said Edico Genome CEO Pieter van Rooyen, Ph.D. The bundle consists of three tiers, based on throughput. The smallest tier of up to 100 TB is envisioned for children’s hospitals, neonatal intensive care units (NICUs), or pediatric intensive care units (PICUs) implementing sequencing capabilities. “What makes children’s hospitals unique is that they have a primary requirement for accuracy in carrying out extremely important rapid and ultra-rapid analysis for critically ill newborns,” Dr. van Rooyen said. Two children’s hospitals are users of DRAGEN for clinical applications. One is Rady Children’s Institute for Genomic Medicine in San Diego, which last year acquired the Bio-IT processor and joined Edico in successfully demonstrating ultra-rapid, 26-hour whole-genome based diagnoses of critically ill newborns. The other is Children’s Mercy Kansas City, whose researchers in 2015 published a study in Genome Medicine showing how the processor cut in half the time needed for STAT-Seq or rapid whole-genome sequencing and genetic diagnosis in critically-ill infants. The bundle’s medium tier, 100–250 TB, is designed for academic genomic centers and researchers working on projects with significant data demands. The large tier, 250 TB to 1 PB (petabyte), is envisioned for major sequencing centers. The tiered model will enable Edico Genome and Dell EMC to offer the bundle to a variety of users, just as Edico has drawn a number of customers to DRAGEN. Other customers include Johns Hopkins Genomics; the sequencing centers of Genewiz, Macrogen, and Earlham Institute; and the clinical labs of Baylor Genetics, HudsonAlpha Institute for Biotechnology, and PerkinElmer.